Then Mad Men happened and everyone in the world wanted to be Don Draper (myself included). The result, of course, is the meteoric rise of The Cocktail. Gin gets all the press in the cocktail world these days, but to me, rye is the heart and soul of a good cocktail. Rye has became so popular that brands that previously had been gathering dust on liquor store shelves can’t keep up with demand, and scores of options (new brands and old) are now available at most stores. A quick glance behind the bar here at the studio reveals that there are currently FOUR different kinds of rye whiskey on my shelves to one solitary bottle of inexpensive bourbon. W.C. Fields once said “I cook with wine, sometimes I even add it to the food.” I feel the same way about whiskey. I’ve been cooking with bourbon for years and I’m always looking for ways to add it to my dishes. It didn’t occur to me until now to try it with rye. I’ve been playing around with a bunch of different recipes using rye instead of bourbon and have been moderately successful. Bourbon adds a smokey, sweet, flavor, but when cooking with rye you’ll notice deeper spice flavors that are a little fruitier and yet not as sweet and smooth as bourbon. My most successful dish with rye was this pork loin with apples. Enjoy! Preheat the oven to 400 degrees. Mix the mustard, apple juice and whiskey together in a bowl until smooth. Generously season the pork loin with salt and pepper, then brush with the whiskey mixture. Allow to sit for half an hour at room temperature. In a large, oven-proof skillet, heat the vegetable oil until it starts to shimmer. Sear the pork in the skillet until it is golden brown. This should take 2-3 minutes per side. Remove the pork loin to a plate. Melt two tablespoons of butter in the pan, then sauté the onion, carrots, celery, garlic, thyme and rosemary until the vegetables are soft. Add the apples and cook for an additional 30 seconds. Baste the pork loin again with the whiskey mixture, then add it back into the skillet along with the juices, pushing the vegetables and apples to either side. 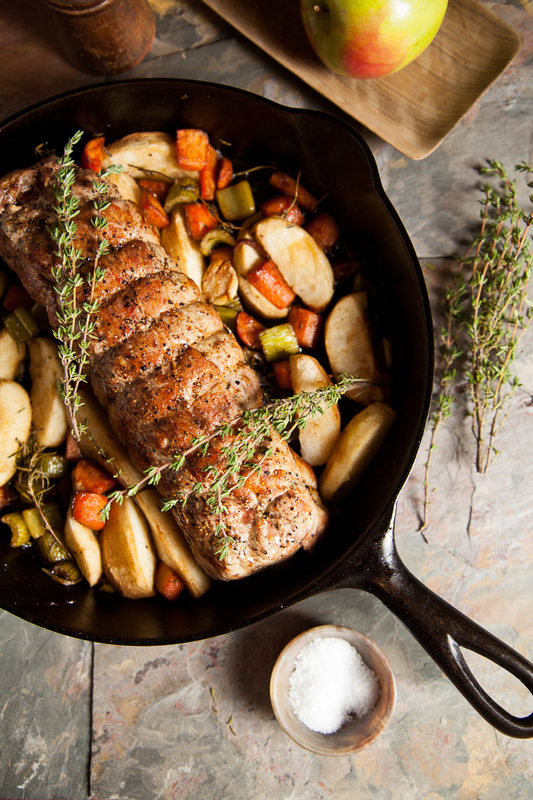 Move skillet to the oven and bake until the pork has an internal temperature of 140 degrees. This should take about 35 minutes. Remove the skillet from the oven, transfer the pork to a cutting board and tent with foil. Remove the herbs and transfer the vegetables to a serving plate. Deglaze the pan with the remaining two tablespoons of butter and simmer until it reduces slightly. Remove strings from the roast and slice into 1/2 inch pieces. Serve with the vegetables, drizzling the sauce on top. For more recipes and food photography, check out my food blog: Shoot to Cook. Happy holidays! Our family celebrates on Christmas eve (we’re of South American descent but Californians), so wanted to share the recipe came out delicious! I have a large handle of bulliet rye bourbon left over from a party Ive been trying to use and wanted a lean meal, so that’s how I found this recipe :). Also, it was my first time cooking Christmas dinner, the pork came out perfect and the veggies (especially the apples) soaked up the sauce. Thanks for posting! !